The Hero Power Rotary Harrow is the ideal addition to your collection of compact tractor implements and attachments. 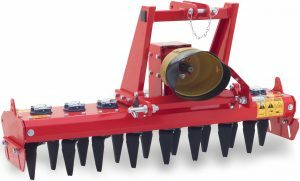 This rotary harrow is the perfect solution for seedbed preparation as spring steel blades aggressively churn the soil whilst the roller gently levels off the aerated soil, leaving a bed perfect for seeding. Ideal for the preparation of ground to be re-seeded or turfed.